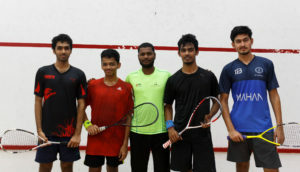 Perhaps the smallest team going to Kanpur for this year’s Inter IIT, the IIT Madras squash team has high hopes. With three out of the four students debuting at this year’s Inter IIT, our squash team hopes to dazzle, astonish and win glory for the institute. The squash team this year features two new players, Radhakrishnan(3rd year) and Vinit Mehta(2nd year). However, it is the first Inter IIT for the captain, Mehul Kumar(2nd year) too, due to the floods last year. The only veteran on the team is Vikas, in his final year, who hopes to end his run with a medal, having been eliminated at Group stages in the last Inter IIT held at Bombay. 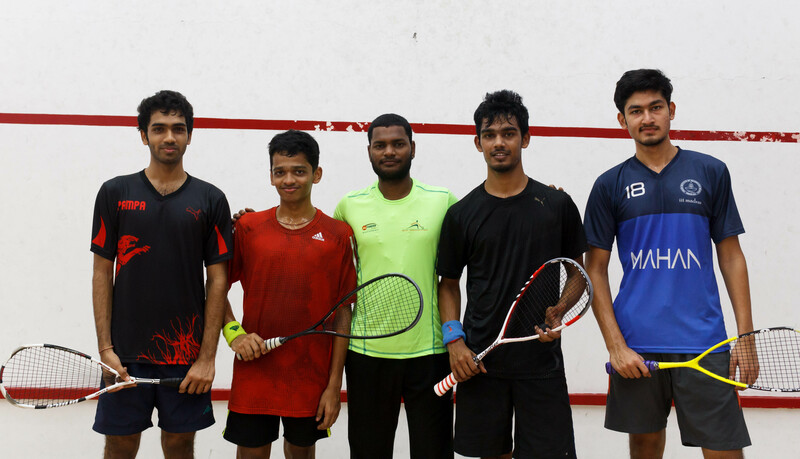 Here are the excerpts from an interview with the Squash contingent of IIT Madras. Why is there no Women’s team for squash? Squash is a recent addition to the Inter IITs, and most institutes don’t even have students who play squash. This is highlighted by the fact that only 6 IITs send teams for squash. The lack of participation in the sport is the only reason a women’s tournament isn’t included in the Inter IIT Meet. How do you feel about the coaching staff, and their dedication towards the sport? For a major part of the semester, we haven’t had a full time coach. The previous coach had left, and despite opening applications for the post, a suitable replacement could not be found. This was due to the fact that Squash, as a sport sees dearth in experienced, elite coaches, when compared to cricket. Also adding to it was the fact that there was a disparity of pay between private and government institutions, as well as the fact that the institute only offers a one year job contract, whereas the number is five in most private coaching centers. We tried our best to push for a coach to the Sports Secretary and the Advisor, and even though they did try, they have failed to find a full time coach. A part time coach was appointed, but only for the last month, which amounted to just 8 sessions, owing to the endsems. However, the same coach was appointed full time for the duration of the main camp leading up to the Meet, and this has improved our game greatly; we’ve begun noticing our game get better, and he’s only been here ten days. We hope a new coach is appointed soon, so that the prep for next year is not hindered. What steps can you take to improve the team for the next year? We think that given a coach, and a whole year’s time, we will improve drastically. This might also help in inducting new students into squash, since having a coach helps in picking up the sport. The team was finalized just before the end semesters, but since very few people play squash, we’ve played together for enough time to know each other’s strengths and weaknesses. In fact, we’ve only moved forward due to us helping each other out in absence of a coach. How would you evaluate the team’s captaincy? With just four in the team, the title of a captain is merely to allot responsibility, and does not carry any great weight. On asking how the captain was selected, Vikas replies with the hint of a smile,”The coach and the previous captain together nominate a student.”. Followed by : “And he(Vikas) was the captain last year”,says Mehul, who is the captain for this year. Have the players done anything specific to prepare in practice? We just do a bit of running and stretching before we start playing squash. Vikas, however, runs for a kilometer, which even the coach deems as excessive warm up! Arm strength is vital for the sport, but it doesn’t usually come into play in collegiate tournaments. But yeah, we need to have a gym session, and that’s only possible with a coach. What do you anticipate to be the biggest challenge in the game? Roorkee has been winning the gold medal every year for squash, so they will definitely be our biggest competitors. We also have a tough competition from the teams in our pool, Bombay and Guwahati. In terms of players, the best players have always come from the Armed Forces. They pick up squash in their days in the forces, and often pursue their MTech degrees in IITs. They are the top seeds and are usually national level players! Unfortunately, we don’t have anyone that experienced in our team this year. All of us are looking to experience the intensity and excitement of a tournament like Inter IIT, and all of us are thirsty for a medal. This is even more important for Vikas, who has made time for Inter IIT amidst his apping and other final year chaos. How do you feel about practice? Practice is the only way to get better at this game, especially since we need to be extremely mindful of our surroundings. We have to make sure we are in position to take the ball and hit it while making use of the back and side walls and while ensuring that our position is not compromised. We need to make sure that we are not hindering the opponent’s view. This might seem difficult for spectators, who usually think that the court is small and congested. Yes, it is, indeed, difficult, but it’s because the court is too large to completely cover. This semester’s practice was mainly the teammates helping each other and watching videos to learn tactics and styles of top ranked players. Our game was greatly improved by the presence of a coach in the span of just ten days. Another major problem with practice is the lack of tournaments besides the Inter IIT. We have no exposure with players outside the institute. However, this is not the same for the other IITs, which take part in other tournaments, against each other and against the NITs. What is the motto of the team or the one thing you’ve learnt about the game over the semester? Push back. Don’t give him the center. That’s vital in a game like squash, since being in that position gives you the ability to push your opponent. What teammate of yours is best to follow on Facebook, and why? Mehul certainly thinks he’s the one to be followed, with his one claim to fame being a CS meme that got a couple of hundred likes on an elitist meme page. Vikas should be followed, just in case he ever lets the secret of his six pack slip. T5E wishes the squash team luck!